If you have any questions about the ELENI information page below please contact us. Motor yacht ELENI was delivered by CBI Navi in 2004 and refitted in 2018, she measures 33,71m (110'7'') and has 5 guest cabins. The cockpit of classically-styled M/Y ELENI is fitted with an alfresco dining area and sofa for taking in the views over food and drinks in comfort. 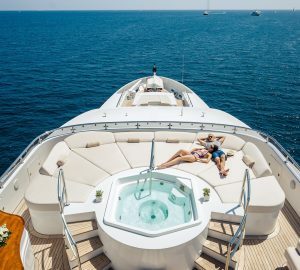 On the foredeck, there is room for three sun loungers and three sun chairs, and the upper deck provides two large wooden tables accompanied by seating for sun-drenched dining. A davit crane to the aft allows for quick launch and retrieval of tenders. The guest accommodation is located on the lower deck and consists of a Master suite, two VIP staterooms and two twin cabins sleeping a maximum of 10 guests, with en-suite bathrooms for convenience. On the main deck, the gorgeous classic interiors use traditional square windows surrounded by high-quality wooden paneling. Forward, eight scarlet chairs are placed around the grand dining table and bright traditional artwork on the forward wall, to add to the ambiance. The salon receives excellent natural light from both sides and table lamps on the sideboards, enhance the night-time ambiance. Three sofas surround a coffee table, while to the aft, doors open up for fresh air and the natural sounds of the surroundings. On the upper deck, the 2018 refurbishment has transformed the skylounge into a carpeted TV lounge which places a C-shaped sofa and drinks table under the port side windows and opposite a 65" widescreen TV emerges from the cabinetry. A pair of 705kw Caterpillar main engines allow for a cruising speed of 10 knots and a top speed of 10.5 knots. ELENI can accommodate a maximum of 10 guests in 5 cabins. Tenders & Toys 1 x Motorboat (tender) 2 x Seadoo (dive scooter) 1 x Stand up paddleboards Communications VHF, HF/MF Audio Visual Equipment and Deck Facilities A/V freshly renewed with new smart TV’s and Sonos system in main salon and new upper salon. Deck provides 3 sun loungers and 3 sun chairs on main. On the upper deck, there are two large wooden tables for cocktails, dining, or just lounging. Each open deck has 2 speakers to stream music through the yacht's WiFi. 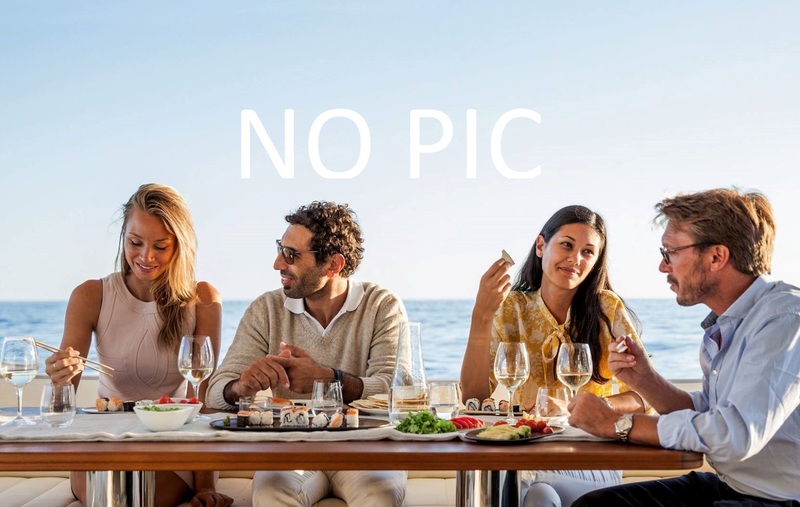 The luxury yacht ELENI displayed on this page is merely informational and she is not necessarily available for yacht charter or for sale, nor is she represented or marketed in anyway by CharterWorld. This web page and the superyacht information contained herein is not contractual. All yacht specifications and informations are displayed in good faith but CharterWorld does not warrant or assume any legal liability or responsibility for the current accuracy, completeness, validity, or usefulness of any superyacht information and/or images displayed. All boat information is subject to change without prior notice and may not be current.